Request a free, no obligation consultation with one of our professional estimators. GET FENCE QUOTE NOW! GET STAIN QUOTE NOW! LOOK WHAT’S NEW!! We NOW Offer financing. Simply click on the link to see if you are pre-approved. Welcome to FenceKeeper, Houston’s trusted local source for your every wood, iron, and chain link fencing need. Unlike many fencing companies, we not only specialize in fence building and installation but also wood staining and fence repair services. We are passionate about helping maintain fences so you can enjoy your backyard or outdoor space for years to come. We can even build a beautiful pergola to further enhance your yard. FenceKeeper proudly serves the greater Houston area including Sugar Land, Katy, Pearland, Missouri City, Cinco Ranch and surrounding areas. Our success stems from our local roots, family oriented philosophy and the professional manner in which we treat each one of our customers. Every fence we build is installed above industry standards and comes with a 3-year warranty because we are confident your fence will last. FenceKeeper installers make it a priority to consistently deliver the best looking fences possible. We can accomplish this because of our years of fencing experience and unmatched attention to detail. Here at FenceKeeper we get that a new fence can be a large investment in your property; we also understand there are different reasons for building a fence from privacy, security, establishing property lines, a boundary for pets to simple aesthetics. That’s why we take care to make sure you are happy with every aspect of the project before we begin our work. Not sure what height, style, material or color of fence you are looking for? Our professional Houston based staff can help you choose the perfect fencing option based on your individual needs. No matter what type of fencing project you need completed FenceKeeper is your solution. Call today and request and estimate for us to build a beautiful fence or pergola that will enhance the look and functionality of your outdoor space. We install a variety of fence styles from wood privacy fences, picket fences, pool fences, wrought iron, chain link fence options and more. Having trouble with your older fence? 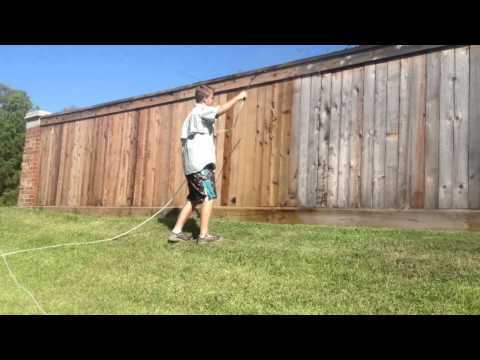 We may be able to save it with our protective fence staining or repair service. Discover why so many local residents make FenceKeeper their first choice for fence installation and protection in Houston TX, Katy, Sugar Land, Pearland and surrounding Texas areas. Protect Your Investment in Your Wood Fence! Our fence is beautiful and well built. Sean always answered my calls and I called a lot but he was always very helpful and very nice. He helped me with the Homeowners Association and with ideas on the fence stain and build. The fence was expensive but I enjoyed dealing with Sean and Melissa. The first person I spoke with was Melissa with FenceKeeper. She was so nice and helpful that I would have bought the fence from them no matter what! They offered great fence service in Houston, Texas. For all you other FenceKeepers, if you think customer service and sincerity don’t matter you need to think again! People appreciate the kindness. These two are two of the nicest and Sean knows his fences! Yes, I would use them over and over. I recommended them to my family members and we all know you have to be sure before you can do that! We are very satisfied with the fencing services FenceKeeper provided to our home. We had different elements, such as new wood fence to match a neighbors’ fence, combined with wrought iron in the front as well as old fence to clean and stain so that all new and old wood looked the same. FenceKeeper matched our neighbor’s fence exactly, and the workers they sent for the job were diligent and friendly. In all, we feel like we got a great deal going with FenceKeeper; they handled everything like pros. Their professional yet friendly attitude, combined with their quality product and fence services in Houston, Texas, will keep us as customers for years to come! Our experience providing you with the best quality staining services grows everyday. We have serviced thousands of customers throughout the Houston metro area, as well as the Austin/San Marcos and New Orleans areas.